Location, location, location, friendly staff and good service. nothing! 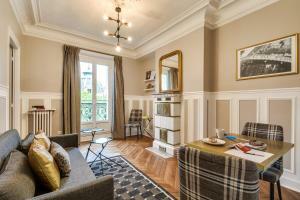 i booked St Germaine IV and got St Germain I, huge difference between the 2 apartments!!!! I emailed you pictures and complained last week but have not had a reply yet. The apartment was in a great location! I could easily walk to all the major sites and/or take the bus or metro. Location was perfect, although a little noisy. Sound proof windows would be fantastic. Very safe and easy to access. Great bars, shops, cafes and museums. Everything at your fingertips. Highly recommend. Good location in St. German close to shops, restaurants, bars, Metro, etc. City lobby to leave luggages was very convenient with very friendly staff and free WiFi and drinks. 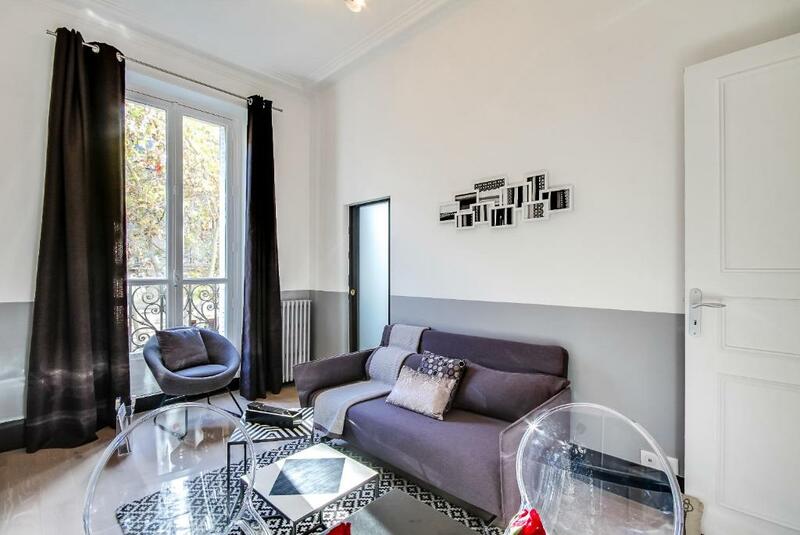 VERY SPACIOUS and BEAUTIFUL PARIS APARTMENT, which is Paris to have a spacious apartment is not common - I've been there 4 times and this is the best by far! 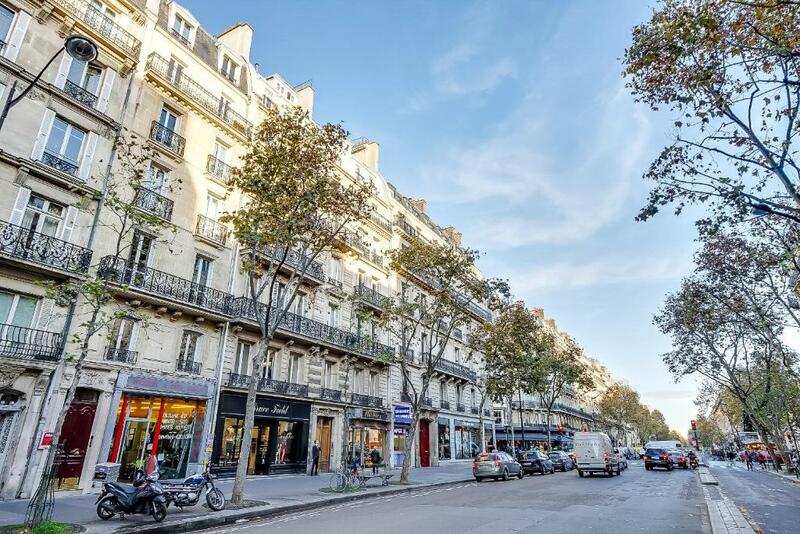 Great location, near St. Michel metro, along the shops filled road but the house is really quiet. And the BATHROOM! The shower is so big (Paris standards) that I still could not believe it. It has a living room, separate kitchen, shower room, separate toilet and the bedroom. Great even for 4 people. Plus many supermarkets a few minutes away. The Sweet Inn Team were all very responsive. This is one of the most beautiful Paris apartments I've been into and I would love to come back! One of our best sellers in Paris! Sweet Inn Apartments-Saint Germain offers self-catering accommodations in several locations in the 6th arrondissement of Paris. Noter Dame Cathedral is located within walking distance. Louver Museum is 2,950 feet away. Free WiFi is offered . Orsay Museum is 0.8 mi from Sweet Inn Apartments -Saint Germain, while Tuileries Garden is 0.8 mi from the property. The nearest airport is Paris - Orly Airport, 8.7 mi from the property. 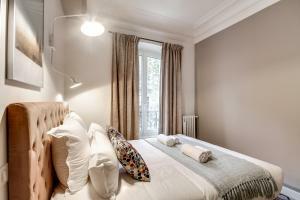 When would you like to stay at Sweet Inn -Saint Germain? Located on the 1st floor with no elevator, this apartment has a washing machine, microwave and kitchen. Located on the 2nd floor with no elevator, this apartment features a washing machine, electric kettle and oven. Located on the 4th floor with no elevator, this apartment has a kitchen, electric kettle and oven. Located on the 4th floor with no elevator, this apartment features a kitchen, microwave and electric kettle. A deposit of EUR 400 is required upon arrival for this apartment. This apartment features a washing machine, microwave and electric kettle. The apartment is located on the third floor without a elevator. 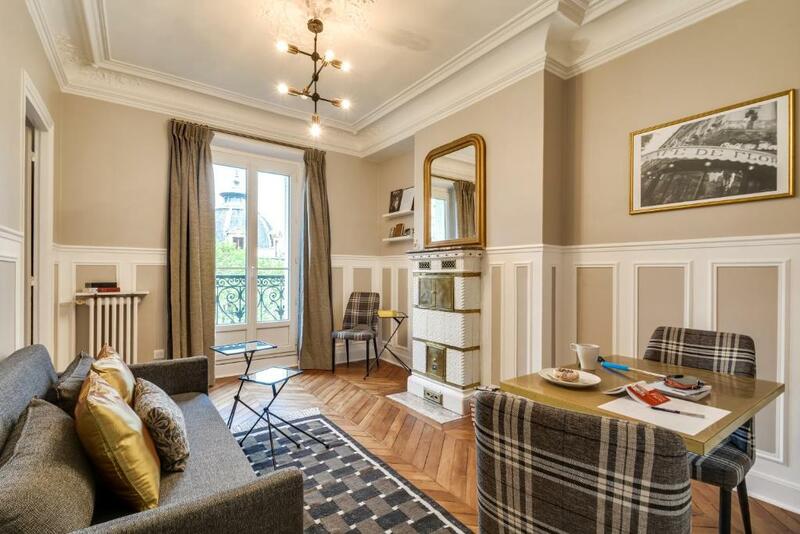 The picture-perfect Saint-Germain vacation apartments put you in the lively heart of Paris. This location offers the option of one or three-bedroom apartments. Inspired by the classic beauty of Paris, our local interior designer has created a sophisticated, romantic space. Artistic prints line the walls, vintage-chic furniture fills the rooms, and flowing drapery adds a gentle touch. Wide windows overlook the City of Lights. Fully equipped kitchens have everything you need for gourmet cooking. Here in the Saint-Germain-des-Prés neighborhood, in the 6th arrondissement, the city’s historical and cultural attractions are steps away. Explore the Luxembourg Palace and Gardens (6 min. walk) or the Notre Dame Cathedral (13 min), then relax with a book at Café de Flore (6 min) or the famous Shakespeare & Company bookstore (11 min). Cozy restaurants, hip bars, and a cinema are right across the street. The Odéon and Mabillon Metro stations are nearby (2 min). Couples, solo travelers, and groups alike will love this artistic hideaway in Paris. This bohemian neighborhood, made famous by its artistic and intellectual residents throughout the last century, has a laid-back vibe. Once home to Simone de Beauvoir, Sartre, Delacroix and Manet -- among many others -- it is still considered an epicenter for contemporary intellectuals, writers and artists. Here, you’ll find historic cafés like Procope, along with numerous museums. Art galleries, ancient churches, and corner patisseries add to its allure. Although you’ll find many luxury boutiques here, it retains an authentic charm and is one of the quieter districts in Paris. One of the most romantic areas of the city, its winding, cobblestone streets encourage you to wander aimlessly and happen upon hidden treasures. Area Info – This neighborhood is a great choice for travelers interested in food, culture and art – Check location Excellent location – show map Guests loved walking around the neighborhood! House Rules Sweet Inn -Saint Germain takes special requests – add in the next step! Sweet Inn -Saint Germain accepts these cards and reserves the right to temporarily hold an amount prior to arrival. Please inform Sweet Inn -Saint Germain of your expected arrival time in advance. You can use the Special Requests box when booking, or contact the property directly using the contact details in your confirmation. Noisy due to its central location facing the road, if you are a light sleeper may be an issue. Sound proof windows would be great. Apartment was a little tired. There were no sheets and pillow covers for the sofa bed. Nothing. I love this apartment! Especially the big, spacious shower coz in Paris that's luxury! Found someone else's dirty (and I mean dirty) towels in the washing machine:(. Plus fire alarm in the lobby downstairs had a low battery so beeped on and off the entire time. I did email Sweet-Inn as our phone had issues but nothing happened. So if you are staying after 9/11/2018 and that alarm isn't beeping, you better assume the battery hasn't been changed and it's flat. So basically not doing it's intended job. Having said this we would stay here again:). But, home was very old... very old chair, carpets, curtains... The house wasn't what it looks like in the photos. I wish the property was cleaner. It is not old or damaged, just need more careful cleaning of the carpet and the facilities. The location is excellent and the host has been super friendly. Rooms are specious (for Paris standards at least). No elevator and apartment on 5th & 6th floors - absolutely not suitable for more elderly people or those with mobility problems and small children. Excellent location, next to Odeon metro stop and lovely apartment nicely decorated with well equipped kitchen. The 90 + steps to our room ( but we did have views of the Eiffel Tower from our balcony ) so worth it. No elevator, no aircon, very noisy main Boulevard under the apartment.